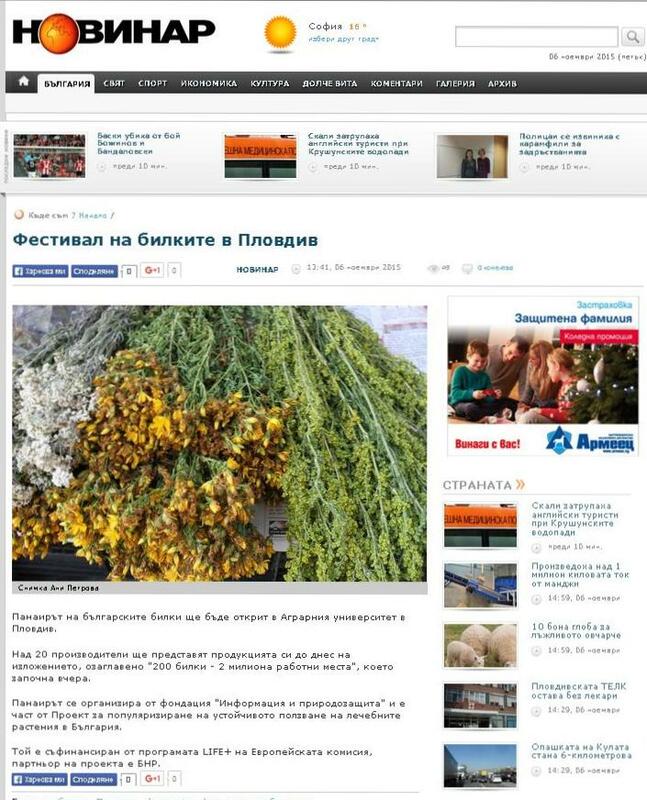 The media coverage of the Bulgarian Herb Fair was wide, complete, diverse and exclusively positive. Neither a single publication with a negative message, nor one directing attention away from the goals of the event or Project was observed. The campaign is in sync with them and at its center are the opportunities for development which the conservation and intelligent use of medicinal plants offer Bulgaria. A total of 105 publications in the period 2-16 November, cover the Fair. The online publications are 103. 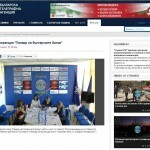 There are more than 11 radio and 5 television news broadcasts and reports and 2 articles in the paper edition of the Novinar newspaper. Facebook was included as a source of news. 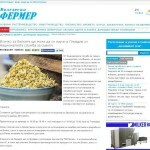 Novinitednes.bg published all information broadcast on the Bulgarian National Radio on the same day as the broadcasts. Detailed information about the forum was available on the websites of the National Agricultural Advisory Service and the project site of Foundation Information and Nature Conservation. All media published detailed preliminary information about the Fair. Some included the hourly programme of the Fair. 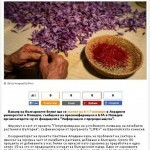 The publications included information about the venue, time, nature of the event, as well as the motto of the exhibition – “200 Herbs – 2 000 000 Jobs“. The main highlights of the programme are also present in the articles. A special emphasis is placed on the premiere of the documentary film The Medicinal Gold of Bulgaria. The information disseminated also includes invitations to the discussions with the participation of representatives of all parties interested in the conservation and sustainable use of Bulgaria’s medicinal plants and to the consultation session, where farmers can receive advice and information from some of the best experts in the sector for medicinal plant cultivation. 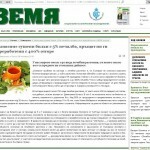 A large part of the publications present some synthesized statistics about medicinal plants in Bulgaria. Part of the publications present the welcoming address of the director of the Regional Inspectorate of Environment and Water in Plovdiv, assoc. prof. Stefan Shilev, as well as the welcoming address of the Minister of Environment and Water, Ivelina Vasileva. 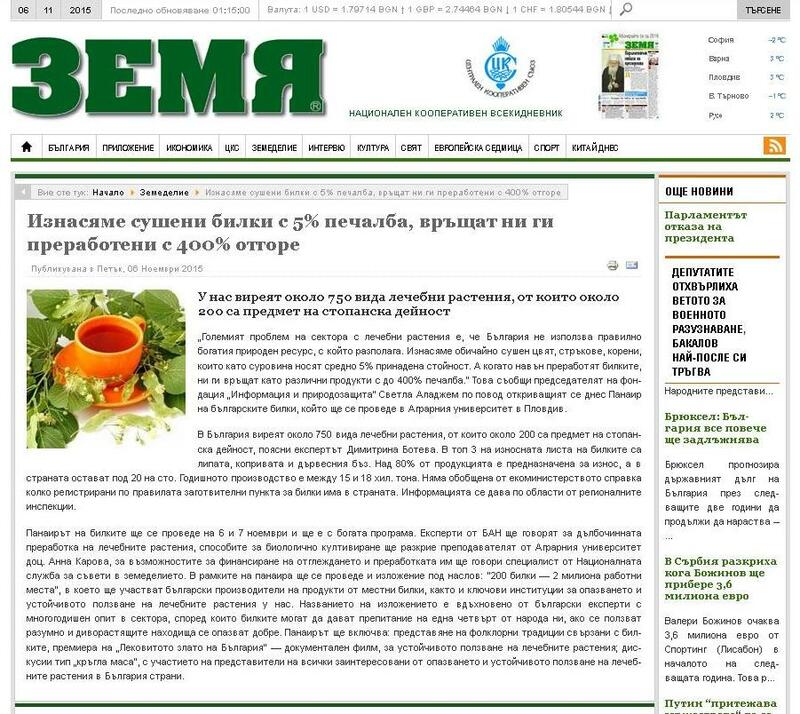 “This fair is a celebration for all those involved in the herb sector – from the collectors to the consumers”, stated the coordinator of the project Svetlana Aladjem, who was quoted by a large number of the online media. The articles repeatedly indicate, that the Fair is being organized by Foundation Information and Nature Conservation, co-funded by the LIFE+ programme of the European Commission and is being executed with the support of the Agricultural University. 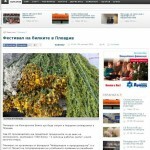 The main thematic emphasis in the concluding articles is: “Bulgaria is a leader in the export of herbs in Europe”. A detailed statistic of the most widespread and sought-after herbs is presented once again, alongside a summary about the companies participating in the exhibition. 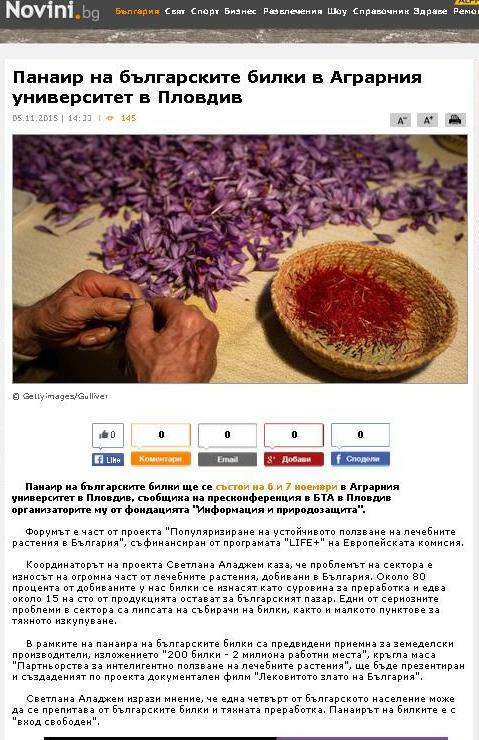 It is clear, that if focused effort and purposeful policy is applied, herbs can give livelihood to over a quarter of Bulgaria’s population. Actualno – 2; agnews. 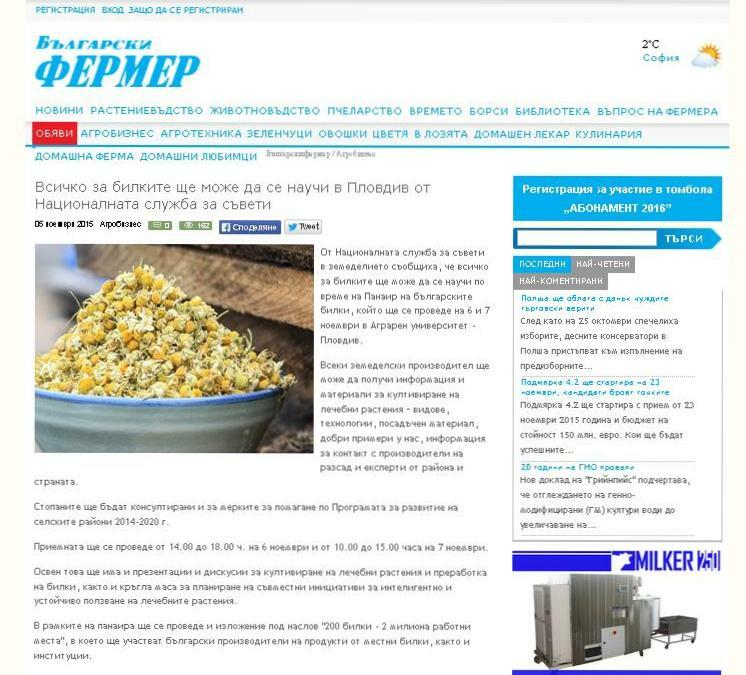 – 1; agro – 4; Agrolife – 1; agronovinite-1; agroplovdiv – 3; Agrozona – 2; alfarss-2; au-plovdiv – 1; Bgfermer – 4; Bgnes -2; Bgnow – 2; Bgvestnik – 1; Bnr – 4; Bta – 4; b2bmedia-1; cross.bg-1; Dariknews – 5; Dnesplus – 1; dnevnik-4; fermer.bg – 6; GustoNews – 3; Infostock – 1; Knnews – 1; marica-2; Monitor-1; Moreto-1; naas -2; Nbox -1; news.dir – 2; Ngobg-1; Pharmmedia – 1; pinterest-1; plovdiv-portal-1; Pochivka – 1; Podtepeto – 1; Skandal – 1; Topbloglog – 2; uspelite – 1; u4avplovdiv – 3. You can download a summary of the publications (in Bulgarian) /pdf/ or contact us for further information.